In A Sand County Almanac, Aldo Leopold set forth his most enduring idea, the “land ethic,” a moral responsibility of humans to the natural world. Aldo Leopold’s land ethic idea is extremely relevant in today’s society, but understanding the land ethic can be difficult. This post will take a closer look at the basic tenets of Leopold’s idea and explore how we can better understand and apply land ethics in our own lives. What did Leopold mean by a Land Ethic? Leopold’s land ethic idea has been discussed for decades by scholars in a wide variety of academic disciplines, from philosophy to conservation biology. For this post, we’re just going to focus on the basics, but readers that want to dig deeper are encouraged to check out this list of books that explore the land ethic in greater depth through a variety of scholarly perspectives. Ethics deal with morality, and an inherent sense of what’s right and wrong. Leopold cites the Ten Commandments as an example of a set of moral standards that help define rights and wrongs in the context of a relationship between individuals. Leopold also talks about ethics between people and their communities, citing the examples of the Golden Rule (do unto others as you would do unto yourself) and the concept of democracy as foundations that inform our societal code of conduct. 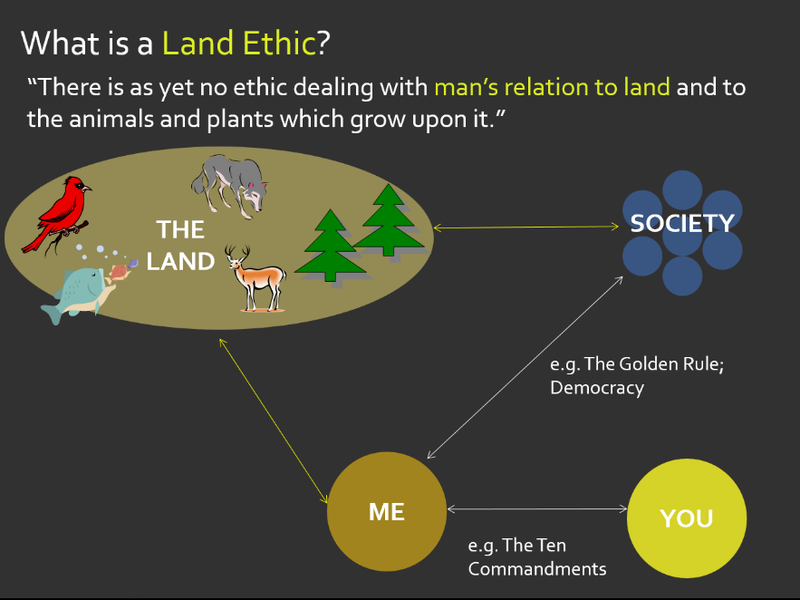 The land ethic, Leopold argues, is the missing piece in what he calls the ethical sequence. This seems pretty simple and straightforward, but it’s still difficult to know how to apply in all cases. In a foreword to a book called The Professor, written in 1987 by Leopold’s graduate student Robert McCabe and focusing on the kind of educator and person Leopold was, Luna Leopold (Aldo’s second eldest son) explores this very concept. In the quote below, Luna points out that these rules may be more complicated than they seem. “Rather than interpreting the concept of the land ethic as an indication of disregard for the individual in favor of the species or the ecosystem, my view is quite different. I see the concept of the land ethic as the outgrowth and extension of his deep personal concern for the individual. Perhaps this is an insight into why Leopold did not present the land ethic idea as a litany of rights and wrongs or a ten commandments of the land. Leopold recognized that people’s environmental values many times grow directly from their experience. He was the kind of person who was absolutely devoted to giving his students, his family and his colleagues the opportunity to get out and connect with nature firsthand. Leopold knew that direct contact with the natural world was a key factor in shaping our ability to extend our ethics beyond our own self-interest. We are all part of the thinking community that needs to shape the land ethic for the 21st century and beyond. To do that, we need to be able to engage in thoughtful dialog that makes room for many different perspectives on the relationship between people and land. Check our calendar for upcoming opportunities. Jen served as the foundation’s Director of Education until 2018. She is proud to have helped create the Land Ethic Leaders program and contributed to the Green Fire film, the Outlook magazine, and the blog. Jen continues to serve the organization as a volunteer.